DOHA FILIPINO workers make up a large chunk of hospitality and health sectors in Qatar. They abound in hotels, malls and medical institutions — both private and government-owned. Besides, the Southeast Asian community has carved a niche in Qatar’s local entertainment scene. Given their innate passion for music, there is a demand for Filipino performers whether for public events, private functions or get-togethers in hotels and other public places. And among the 175,000 Filipinos in Qatar, a significant number of them are quietly making waves in fields not much known to others. These Filipino men and women are playing an important role in their respective works of life, away from the usual spotlight. 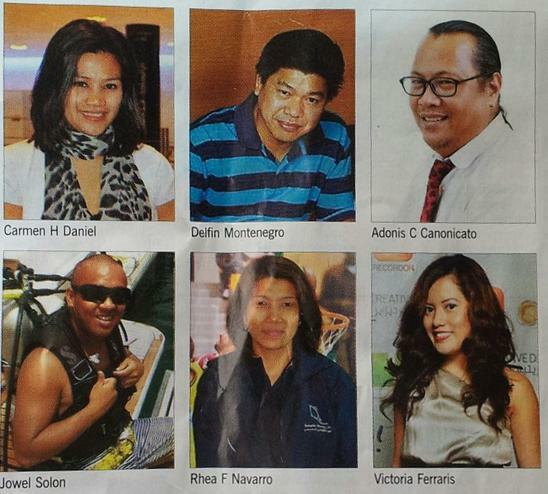 In the field of sports, a number of Filipinos are lending their technical expertise to Qatar. But in the Qatar Basketball Federation (QBF) — under the umbrella of the Qatar Olympic Committee (QOC) — the expert handling of professional foreign players who play in the league is the prime responsibility of a Filipino woman. Rhea F Navarro makes use of her more-than-a-decade experience in the sport to develop Qatar’s basketball expertise. As the players’ affairs supervisors at QBF, she oversees the requirement for the national team in relation to Qatar’s participation in FIBA Asia Championships and deals with the foreign media. “Working in such a male-dominated field is never a problem for a tough cookie,” she said. With her full grasp in basketball, she is confident of her position. “Filipino workers are diligent and dedicated professionals who know their craft well. We love what we do and this makes for rendering an excellent job regardless of title or industry,” said Rhea. Filipinos are not to be outdone in the field of arts either. The Qatar office of PICO International, one of the world’s leading experiential marketing service providers, has architect Adonis C Canonicato as its design director. Canonicato designed the Qatar Pavilions at the world expo in Nagoya, Japan, in 2005 and in Zaragoza, Spain, in 2008. He was also behind the concept of Qatar Reception Lounge for World Petroleum Congress held in Madrid, Spain, in 2008. For this native of Iloilo, a province located in the Western Visayas region of the Philippines, the innate ability of Filipinos to adjust to any work situation is the strength of Filipino workers. “It is mainly because we come from a country where we can find homeless & jobless people around us. So, having a job is considered to be a blessing. We are from a country which produces competitive professionals. Finding a job abroad is also not that easy as we have to compete with other nationalities. And most of all, we pride ourselves in being creative and resourceful. So that’s why, we can be found in any part of the world, in whatever type of job it maybe,” he said. Another Filipino, who is making a buzz in creative arena not only in Qatar but across the Gulf, is Joe Chua Agdeppa. This native of Palawan, a famous tourist destination in the Philippines, earned the reputation of being one of the Gulf’s most diverse photographers. Among his clients include sheikhs and several members of the region’s royal families. He was the winner of the Katara Eid 2011 photography competition and winner of Doha- TweetUp and W Hotel Photography Competition 2011. His works made it to the pages of National Geographic, Professional Photographer UK and Illustrado magazine. Joe believes the Philippines will one day get back on its feet and reclaim its stature as the region’s most promising nations. “Our thirst to have a better life for our families makes us endure all challenges ahead of us. We have a unique ability to survive challenges and smile at every obstacle and find a silver lining in every dark cloud that befalls us,” he said. Meanwhile, Filipinos are playing an active role in the glamorous world of fashion. Victoria Ferraris, currently the sales manager of Time Out Doha, a title under the biggest publishing house in the Middle East, is among Qatar’s most well-connected media person. Also a PR consultant, social media blogger and fashion stylist, Ferraris has initiated and popularised fashion related events in the country. She said, “As a Filipino I am proud to say that I am where I am now. I enjoy life. I love what I do and I embrace all other culture.” Another top lifestyle and fashion magazine, Isola, has Carmen H Daniel in its roster as sales consultant. “I consider myself lucky to be given an opportunity to mingle and deal with different types of people at various levels in business and industries. It is a huge challenge for me to work with colleagues in a multi-cultural environment, although being the only Filipino staff in our department is not that easy,” Carmen said. Being an engineer, more so, in a construction firm is no walk in the park. But for Helen Valera, a QS engineer with Terna Qatar, a Greek construction firm, working in such a male-dominated field is not about the gender of the worker, but all about technical know-how. “Filipino workers, particularly women, have a strong endurance to pain and hardship. I don’t find it difficult to work with men because the task is about applying what you learnt from school and earlier work experiences,” she said. Helen used to work as estimator-project engineer in the Philippines. A familiar face gracing the television of Filipino families here is Delfin Montenegro. He is the Middle Eat News Bureau Correspondent of The Filipino Channel (TFC), a Filipino subscription-based international television network based in California and owned by ABS-CBN Corporation. With his task of reporting the happenings on and about Filipinos in Qatar, he is a popular personality within the community. For Delfin, the Filipinos working abroad are the unsung heroes of the Philippines. Of all the professional opportunities in Qatar, perhaps one of the most demanding ones is those related to serve the royal family. But according to Jowel Solon, working with the Amiri Diwan Yacht Protocol Qatar for six years now, serving the Qatari royal family and their guests is both an honour and a challenging task. As a deckhand, a job that entails assisting the captain of the diving boat, he gets to serve the royal family and their guests whenever they are out in the sea for dive fishing or water sports. Jowel said there are about 38 Filipinos working in this section of the Amiri Diwan. “I love my job. The members of the royal family are really good employers. They are polite, despite their position in the society. And I can see their respect and admiration towards Filipinos,” he said.